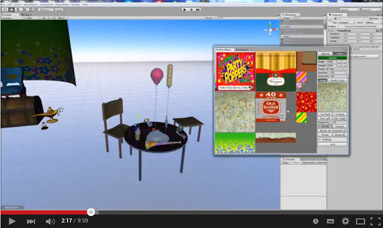 This program allows you to select a group of game objects or prefabs and quickly combine them into a single prefab. Texture atlasing is handled automatically but you have the option to manually move, rotate and scale the textures for the best fit. Creates small swatches with a solid color for objects with no textures so that they can be grouped by the same shader. You have full control over the atlas settings to output either highly compressed or hi-res textures. Comes with tools to position and center the pivot point for the new prefab. 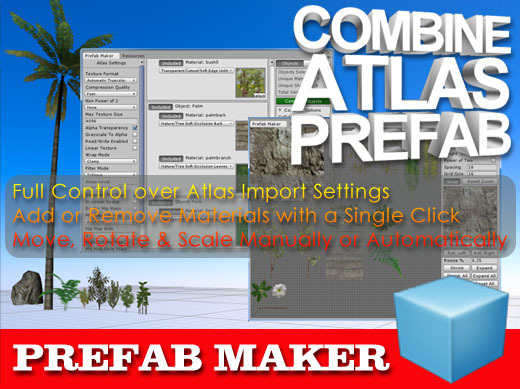 Prefab Maker allows you to select a group of game objects or prefabs and quickly combine them into a single prefab. Texture atlasing is handled automatically but you have the option to manually move, rotate and scale the textures for the best fit. Creates small swatches with a solid color for objects with no textures so that they can be grouped by the same shader. You have full control over the atlas settings to output either highly compressed or hi-res textures. Comes with tools to position and center the pivot point for the new prefab. The folder you select to save the new prefab, mesh, materials and textures to will be cleared of all files before saving. Always make sure to save to an empty folder when creating a new prefab or the assets in that folder will be lost. Compatible with both Unity Free & Professional versions. Suitable for static meshes only. Currently no support for tiled textures.